St. Martin church is in the list of state national cultural monuments. At present time, an organ from 1904, built in Krnov, is used for playing. It is a two-manual instrument with 36 stops made by Rieger Kloss company, which was used as a sample product to attract new organ customers in local company. A new gallery for public is to be opened in 2014. The church was firstly mentioned more than 700 years ago (1281). The church was built under the auspices of the Order of Teutonic Knights. It was renovated and extedned for a few times. The original construction was made of wood, but later, at the turn of the 14th and 15th century, the church was made of stone. The first nave of the church was in a gothic style. Later, the side naves were built up. Originally, the church had only one tower (southern, right), which is still evident. 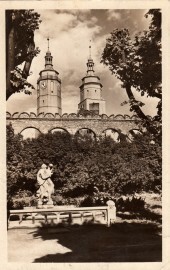 The second tower was built up later in the 16th century together with a gallery. It was called “the town tower”, because it operated as a watchtower. Two towers of a different shape were parts of a town defensive system. They are 67 m high. The church, together with castle, suffered the worse damage during the great fire of Krnov in 1779, when the vaulting fell down. Its interior was delicately reconstructed in a late baroqu style, with elements of an upcoming classicism. A major altar was also reconstructed in the same style. There was a cemetery all around the church. At the beginning of the 20th century, four local tombstones, coming from the 16th century, were put into the northern church wall. Křyštof Bilický from Bilice, a castle doctor of a Polish origin, is buried here in St. Martin church. He is buried under the polychrome tombstone in the side chaple. The tower watcher operated as a town patrolman. He guarded the town and its surroundings untill 1900. He lived with his family in the height of 50 m in a town tower. His hourly duty was to walk around the tower gallery and watch the town. Once he found out everything all right, he tooted a simple tune into four quarters. Once the fire broke out in the town he rang the bell and honked. The direction of the fire, he marked with a flag in the day and with a lantern in the night. When the wiring was under reconstruction in 1967, some ground works had to be done. What a surprise that was as two crypts with coffins and human remainings appeared. A detailed examination found out that this was the place, where honorable citizens of Krnov such as a postmaster, monks and priests were buried. Their coffins were marked with silver labels of a heart shape and the name of the person buried, the date of birth and the date of death. After examination, the crypts were covered with tiles again, because those who are resting there deserve peace and quiet. In the rear part of the church an entrance appeared. Based on the local legend, this mysterious underground corridor is to continue under the whole town and ends just under the ruin of Cvilín castle, nowadays called “Šelenburk”. Worship services are held every day. Monday from 6 p.m., except the first Monday in a month, when the service starts at 5 p.m. The possibility of the Sacrament of Reconciliation from 5,30 p.m. to 5,50 p.m. in a confessional. Tuesday from 7 a.m. The possibility of the Sacrament of Reconciliation from 6,30 a.m. to 6,50 a.m. in a confessional. The possibility of the Sacrament of Reconciliation from 5,30 p.m. to 5,50 p.m. in a confessional. Monday: 6 p.m. The first Monday in a month from 5 p.m. The possibility of the Sacrament of Reconciliation from 5,30 p.m. to 5,50 p.m. in a confessional. Tuesday: 7 p.m. The possibility of the Sacrament of Reconciliation from 6,30 a.m. to 6,50 a.m.
Wednesday: 6 p.m. An adoration follows just after the mass from 8 p.m. The possibility of the Sacrament of Reconciliation from 5,30 p.m. to 5,50 p.m. in a confessional and later with a common introduction of adoration from 7 p. m. to 8 p.m.
Thursday: 7 p.m. The possibility of the Sacrament of Reconciliation from 6,30 a.m. to 6,50 a.m.
Friday: 6 p.m. The mass is focused on parents with children. The possibility of the Sacrament of Reconciliation from 5,30 p.m. to 5,50 p.m. in a confessional. Saturday: 7 a.m. The possibility of the Sacrament of Reconciliation from 6,30 a.m. to 6,50 a.m.